Zakynthos the flower of east overflowing with greenery, dancing rainbows of flowers pine clad hills boasting with deep emerald waters, golden fine sand and a number of caves. A majestic celebration of life and fertility. 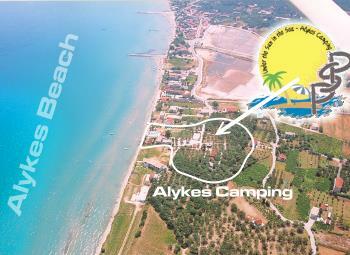 Our camping is situated by the sea at the northeast side of alykes beach, in a very peaceful are, 150 m from the center of the village alykes where you can find many shops and services and several facilities like renting cars or bike, booking trips and excursions or doing water sport and of course a big variety of restaurants, bars, super markets. It is situated 30 mts. from the beach of Alykes and 300 m. from the centre of the resort. It is equipped with all facilities of a modern camping, such as showers with hot running water, toilets, laundry and , washing-mashine, mini market, swimming pool & snack bar operating all day etc. It has plenty of natural shadow provided by hundrets of olive trees. You can enjoy daily excursions to the Blue Caves and the famous shipwreck beach with daily boat cruises that depart few meters from our camping. At the camping you will find a warm and friendly environment, which will certainly remain unforgettable.